Leaves of the Bel tree are used extensively in the worship of Lord Shiva. 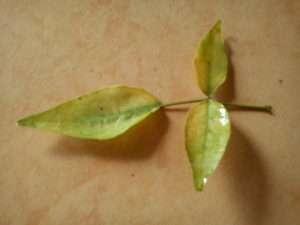 Three leaves, three benefits, similar to the three eyes of Lord Shiva, and having three qualities. Sins of three births are destroyed by offering one leaf of the Bilva plant to Lord Shiva. As with most other rituals that intertwine science with religion, the Bel tree has been highly for the medicinal properties contained in its root, fruit and leaves. It is a healing tree which cures all diseases caused by vata (wind) and gives strength to the body. See Health Benefits of Bael. Across India, Bael / Bel / Bilva / Bilwa / बेल is also known as Sriphal, Bilva வில்வம், Koovilam கூவிளம், বেল, ବେଲ, ಬೇಲದ ಹಣ್ಣು, Gorakamli, കൂവളം, Kaveeth, Beel, बिल्वम्, ڪاٺ گدرو, Beli බෙලි, Vilvam வில்வம், Maredu మారేడు. Across South East Asia, Bel is known by different names: ព្នៅ, Maak Tuum ໝາກຕູມ, Pokok maja batu, Mahh dtuumm มะตูม, Luuk Maah dtuumm ลูกมะตูม. Scientifically, Bel is called Aegle marmelos.